Landscapes are not merely physical resources to be catalogued and managed but are “places with a story, which people take care of and with whom they develop a sense of belonging” (Williams and Patterson, Soc Nat Resour 9:507–521, 1996). 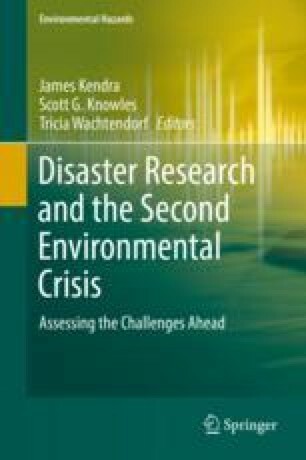 Efforts to transform environments to reduce disaster risk, if not integrated with the stories and social and emotional conditions of the community at risk, may face opposition, apathy, or lack of political or financial support. At the same time, in this period of dramatic climate change and increasing disaster risks, efforts to produce only comfortable and beautiful landscapes may create potentially dangerous ones. Drawing on studies, land use planning projects, and risk reduction efforts in Norway, the US, the Netherlands, Italy, Hong Kong, and Chile, this essay argues that integrating environmental aesthetics principles, nature conservation, ecologically oriented landscape design, and disaster risk reduction can help communities create and maintain sustainable, safe, and ecologically healthy environments.